June 7, 2017 SEOBy DEANknows! One of the most common questions that come up when discussing creating a Digital Marketing plan is what is more effective – SEO or PPC. Many people are not sure of the difference between the PPC and SEO, much less which one is more effective. Just to get some of the terminology hurdles out of the way, we should first cover the basics of both SEO and PPC. Below are the most commonly used terms and their definitions. PPC – Pay Per Click – Also called AdWords or even more specifically Google AdWords. These are ads that come up when someone Googles a particular search term. These ads can be above the organic results, below the organic results or even on the right side of the page of the organic results. In PPC advertising, you are only charged when someone clicks on your ad – which delivers the searcher to your website or landing page. There are hundreds of types of PPC options, from Google and from the other search engines. For the sake of this article, we will only be covering the effectiveness of basic Google PPC, specifically for a search term that could otherwise have been organically ranked for. Notice – PPC ads are notated with a small notation that they are advertisements. SEO – which stands for Search Engine Optimization, also called Search Engine Marketing or Organic Ranking is showing up for a particular Google search in the ORGANIC results. If ads have been placed on a particular search, even the first organic search results (AKA #1 on Google) will show BELOW the ads. Unlike PPC Ads, organically ranking for a search term takes time and effort. It is important to understand that SEO today can mean much more than simply ranking for a specific keyword. For the sake of this article, we are only looking at the direct, organic ranking aspect of SEO. Both SEO and PPC have the goal of driving targeted traffic to your website or landing page. That is about where the simularities end. 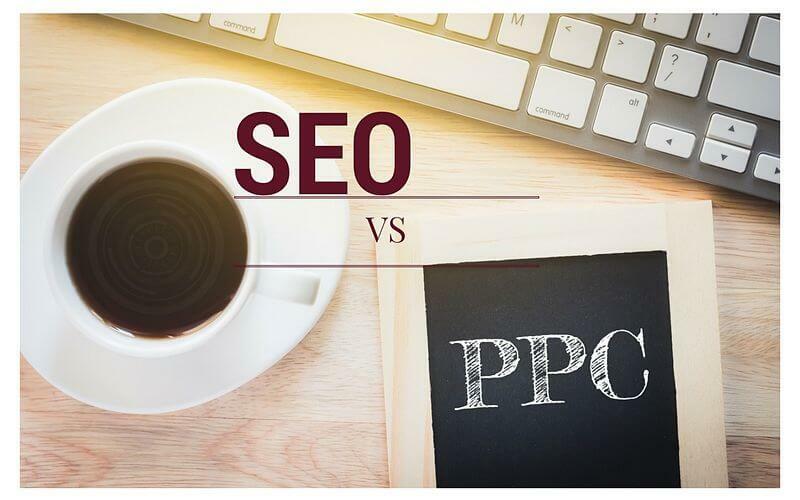 Before we can decide if SEO or PPC is better for you, we need to cover the differences between the two digital marketing options. One of the biggest differences in the two forms of internet marketing is the time it takes to begin seeing results from your advertising spend. With Google PPC, you can literally have an advertisement up within minuets, which means you could start getting targeted clicks to your website immediately. On the other hand, SEO takes time to implement. Any search term, that has a decent amount of competition, can take months to organically rank for — especially if you are starting from scratch. Once you have a site that is ranking for some competitive keywords and has some solid domain metrics, you can more easily rank for peripheral searches. Yes, you can have your Google PPC ad up and delivering targeted customers to your website within one day as opposed to months. Keep in mind, as soon as you stop paying Google PER CLICK – that ad disappears. PPC Ads work much like a faucet… you can turn them on quickly, but just as quickly, they go away. Organic ranking from SEO has much longer lasting results. Once you rank for a particular keyword or key-phrase, as long as you are not implementing black hat SEO tactics, you should continue to rank. That doesn’t mean that if you have made it to #1 on Google, you are guaranteed to stay there. It does mean that just as it took you time to make it to the top of the hill, it takes time for someone else to pass you up. Click through rate is a metric that looks at once someone is viewing their Search Engine Results — What are they going to click? Many people think that the top result (which is usually an PPC Ad) would get the lions share of the clicks. That is not true. There are thousands of articles on how to increase your Click Through Rate. Whether you are running PPC ads or dealing in Organic SEO, you should optimize to for CTR. Optimizing your meta title as well as your meta description can dramatically affect the Click Through Rate of your ranking. We are looking at the differences between the CTR of PPC vs SEO so putting everything on a level playing field, the first organic search result will far outperform any of the ads. In many instances, even the #2 or #3 ranking will have a higher CTR than the ad. That is because many people that use Google for search will consistently skip over the ads, going to the first organic search result. Here are some examples of CTR for Search Engine Optimization placements. These are estimates and can vary wildly on a variety of factors including the number of ads that are on the SERP, the SEO meta titles and description of the organic results and the quality of the advertisements placed and the additional functionality on those ads..
For the exact same reason that you can get a PPC ad up in a day is the same reason people skip over them. Google’s algorithm focuses on delivering the most relative content for a particular search query. People understand that advertisements are bought, and the ORGANIC results are more likely to give them the best answer. This part of defining which is better…SEO or PPC, is usually overlooked. In most instances, having your brand seen, in organic results thousands of times every month is a powerful thing. Even if you don’t get the click – the searcher has been exposed to your brand. Although it is true that your brand is exposed when running a PPC ad campaign, you get much more brand recognition from organic search results. When you show up in a heavily searched list, you get credibility. 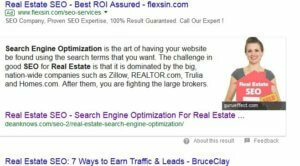 Lets say you are attempting to rank for some real estate keywords. What do you think the branding effect is when your real estate website is positioned right after Zillow and Trulia? What if you are the ONLY real estate broker on page 1 of Google – sharing the top spot with all of the nation-wide real estate websites? Now we are getting to the meat of what most of you are looking for. When looking at SEO vs PPC – which one costs more? Which one delivers a better return on investment? Where is your advertising budget better spent? Truth is, there is a direct correlation between the CPC of a Google PPC ad and the cost you will incur to organically rank for the same term. The CPC or Cost per Click that you pay Google when running an Adwords campaign is usually derived from auction. That means the CPC will fluctuate based on what other people are willing to pay for that click. Similarly, what an SEO company will charge you to rank for a particular set of keywords is based upon the competition currently ranking. Simply because the more competition (or stronger the competition is) the more work it will take to beat them out for a page one ranking. One thing most marketers look at (when determining their price) is the CPC for AdWords. If that price is through the roof, you can all but guarantee it will be a challenge to rank for. This is why many SEO gurus stay away from Real Estate SEO – because the level of competition is fierce. 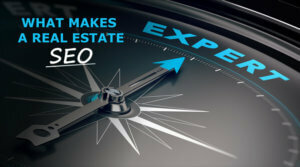 Looking for Real Estate SEO? So Which One Is Better SEO or PPC? There is little argument that ranking high on page one of Google is better than having an ad on the page. What we are really talking about is which one provides the best ROI. Is your money better spent having an ad up immediately and only paying when someone clicks it or spending money over time to show up organically for the same search? That answer really depends on a variety of factors. Below are some of the factors that should affect the cost of putting together a SEO campaign, thus should help in determining which one is better for you. One major thing that will help you decide if PPC or SEO is better for you is understanding your domain metrics. What is your current back-link profile? Does your existing domain already have authority? Does your existing domain have a good Trust Flow? If you have a well established domain, it is substantially easier to rank your website. This doesn’t mean that if you have a brand new domain, you should choose PPC, it simply means that you should have less time and money spent on the SEO side of the equation. Do you have the time and money to spend in SEO without seeing immediate results? Personally, we believe Organic Search Engine Optimization provides a better long term Return On Investment. Long Term being the critical words there. You will start spending money on SEO and wont see any major difference in rankings for some time. Whereas PPC provides immediate traffic to your website. On the SEO side, you must be prepared to spend money today to generate traffic down the road. Many people get nervous writing a check every month and not getting something tangible from it. One of the biggest selling features of PPC over SEO is the cost is mostly incurred when someone actually clicks the ad. Notwithstanding having your PPC campaign professionally set up, monitored and maximized, the bulk of the costs are incurred from Google. SEO simply doesn’t work that way. Copyrighting can get extremely expensive. 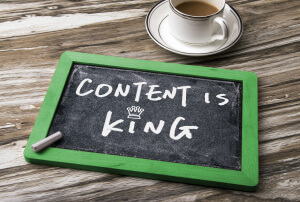 Original, quality content is critical for any SEO project. That being said, if you or someone on your team is a really good writer, them augmenting the copy put together by the SEO company can save you quite a bit of money and shorten the time involved to rank. The idea behind this is (again) if you can reduce the spend for SEO, it becomes even more attractive from the ROI perspective. Using Both SEO and PPC? Needless to say, this can get a little more expensive but if properly implemented, can provide a tremendous ROI. The idea behind running BOTH Pay Per Click advertising and a Search Engine Optimization campaign may seem redundant at first glance, but hear me out. Below are some great examples of when and why to do so. For most established brands, most of the traffic from search engines are from someone Googling their business name – and the type of business, which is called a branded search. These are people not searching for THE product or service but a specific brand of product or service. For instance, if someone is searching for a specific company PLUS the product (or service) they provide, you can place an ad on that page. This can pull new traffic directly to your website, when people were searching for the competition. Many companies pay for Google ads on their own name to avoid exactly this. We have found that a holistic approach is usually best when devising an Online Digital Marketing plan. That being said, having your website get some traffic from Google Ads (while you build your SEO) can be an important part of an overall SEO campaign. That means if you can use Google ads to drive traffic to your website and then because you have built a “sticky site” – people find themselves clicking through multiple pages this will actually HELP your SEO. Needless to say, you cant rely on this to rank a site on its own, but if done properly, it can assist. And by the way, you can make some sales along the way. Once your SEO starts to really kick in, you can simply turn off the ads. What Provides a Better ROI In Your Situation? From the Digital Marketers perspective, when dealing with a finite dollar amount of advertising dollars, decisions need to be made where to place the ad spend. The savvy marketer looks at their clients business model, their business goals, all of the pros and cons of the different options and makes an educated decision.